First check that the main valve coming in to your house and any valve to your shower is fully open. If these valves are not fully open then there may not be enough water getting to your shower. Make sure the shower head is clean and the hose isn't kinked- this can happen just behind the handset where it may be difficult to see). If possible also try to check the inside of the hose; although it may look okay on the outside, it may have collapsed internally. Another possibility is a faulty flow/stabilizer valve not allowing the correct amount of water in to the shower. 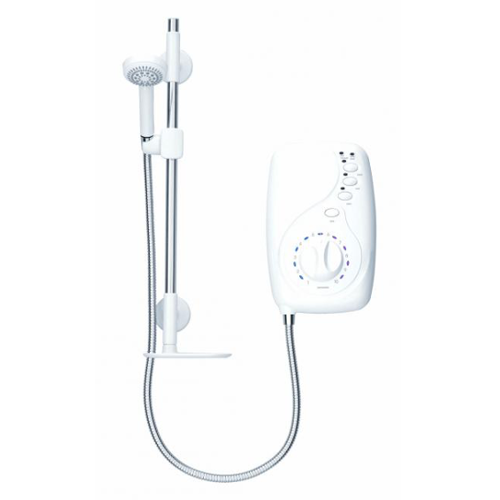 A quick way to test the flow valve is to remove the shower head, turn the temperature to fully hot and note the amount of water flowing. 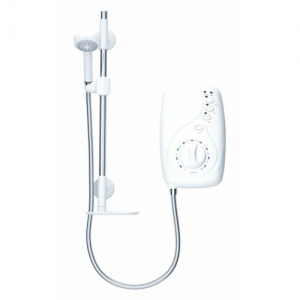 Then turn the shower fully cold and note the amount of water flowing. If there is little difference between the two then it may be a faulty flow valve. The last possibility is a faulty PCB.